As the market is entering the Asian session we are seeing a new batch of potential trades coming in. The first of many opportunities is related to the Japanese Yen against the US dollar. We would be buying puts on the USD/JPY if the price goes above daily highs from today in the 103.90-104 area. The main reason for this call is the pretty sharp rally that has already occurred in this particular binary options forex pair. There is no doubt in our minds that we could see a reversal, however with all likelihood it is not going to happen before there is a fresh catalyst for it. Since we will see a plethora of data releases from all over the globe on Thursday it makes sense to position ourselves for the coming volatility. As the USD/JPY pair has opened in New york around 103.69 it has been consolidating ahead of the next attempt to break the solid resistance level at 104. As the private employment data from the ADP has triggered a rally to 103.81, however that proved to be the most that the pair could achieve with such a small catalyst. Traders have taken this spike higher only to reassert their short positions on the US dollar and selling orders have driven the pair back into oblivion - below 103.60. After this move all markets have entered somewhat of a quite phase with the bond market taking cue and driving interest rates higher - supporting the US dollar, while the stock market has really had a session without much direction. Ahead of the key events tomorrow that will bring clarity to the state of the world's services industry and the ECB press conference later during the day, we could see some more stagnation in activity. Japan will be releasing its data figures soon with numbers about how much foreign stocks and bonds Japanese investors have bought. As the key takeaway from this data is not very likely to be surprising, there is not much reason to believe that this set of data will play an important role. 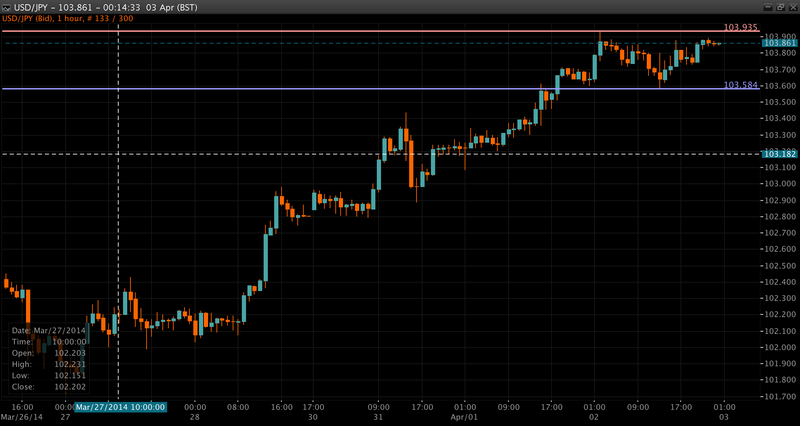 The main data point will be the Chinese services PMI which is expected at 01:00 GMT and 01:45 GMT from the HSBC. The US calendar is also worth a look, as we will get some key figures from across the Atlantic - Weekly Jobless Claims and the Trade Balance figures for February. Despite this umber looking a bit backward it can provide some ideas. So to sum up for now we prefer to buy daily puts for the expiry at 23:59 later today at any level above 104. More aggressive players can start from 103.90.